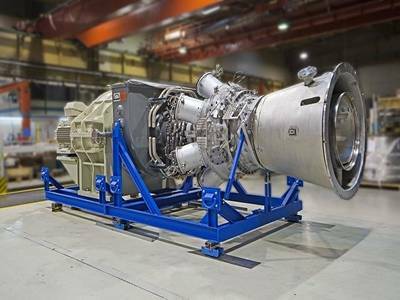 This new generation gas turbine can ideally supplement strongly fluctuating renewable energy sources such as wind or solar power as generator drives and is not only highly efficient say the engine builders, but exhaust gas pollution is extremely low as well. "In addition to the particularly high efficiency, one of our primary development aims was that the new gas turbine family had to be equally economic and environmentally-friendly all the way down the line," says Dr. Sven-Hendrik Wiers, Vice President Gas Turbines. "The single digit NOx values now realized in the load range between 50 and 100 percent with the MGT 6100, the single-shaft version of the new MGT gas turbine family, impressively prove that we have achieved this aim." "We are convinced that we can repeat this excellent result in further versions of the same type. In a further step, we are planning on guaranteeing our customers very low nitrogen oxide values based on the test results, thereby increasing the competitiveness of the gas turbine," says Frank Reiss, Head of Combustion Technology. The development department in Oberhausen achieved these extremely low emission values with an ACC combustion chamber modified and further developed for the new gas turbine generation."